Whether you're growing one, or sponsoring someone else's 'stache, November means moustaches. But how does the Movember Foundation use the millions of dollars that it raises each year? One of their initiatives is the Social Innovators Challenge, a $5.2-million fund that is backing solutions to problems relating to male social isolation – such as Homebase, Dentistry professor Richard Hovey’s new initiative to help men who are living with chronic pain. Four years ago, Richard Hovey found himself “on the wrong side of a hit-and-run cycling accident.” Through physiotherapy and exercise, his superficial injuries healed. One afternoon, he played an uneventful game of tennis. That night, he woke up from a nightmare that he was in the worst pain of his life. Except it wasn’t a bad dream. His family physician was baffled by this sudden onset of pain, so Hovey turned to the Alan Edwards Centre for Research on Pain and the pain management unit at the Montreal General Hospital. Hovey knows those places well — because that’s where he studies other people’s pain. Hovey is an associate professor in the Oral Health and Society Division of the Faculty of Dentistry. Throughout his research career, he’s done extensive interviews with people living with chronic health conditions and pain, particularly pain caused by osteoporosis. His newest research project is inspired by his own experiences living with chronic pain – and it’s being funded by moustaches. Since 2003, the month-long Movember moustache-growing international fundraiser has generated more than $670 million for programs focused on men’s health issues, such as prostate and testicular cancers, mental health and physical inactivity. Hovey’s project, Homebase, is supported by one such program: the Social Innovators Challenge, a $5.2-million competition open to people with fresh ideas for addressing male social connectedness. Hovey’s project explores a community-based approach to increasing social interactions for men living with chronic pain. In medical terms, “acute pain” spans the first three months that a person experiences pain; anything longer – whether that’s measured in weeks, months or even decades – is considered chronic pain. And the longer a person lives with chronic pain, the greater their risk of isolation – and that, says Hovey, is where the suffering really becomes serious. 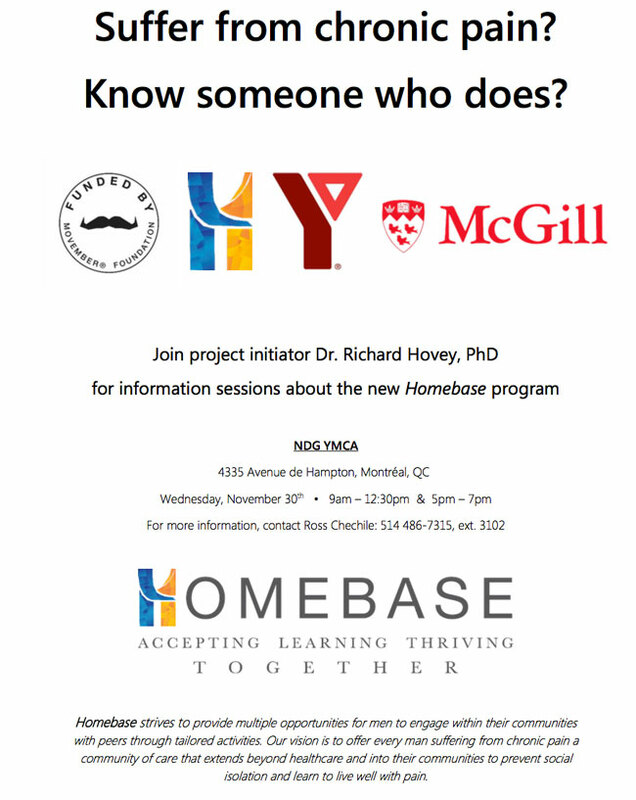 Homebase is the first McGill faculty research initiative funded by Movember. (Movember has funded three Research Institute of the MUHC projects; see sidebar for details.) Right now, the project is in the development stage, with the potential for additional Movember funding for a pilot project and possibly scaling-up to national and international scope. Hovey’s inspiration came from the men he met at his pain peer support group. People with chronic pain may need to take a leave from their jobs, and often can never return in full capacity – or at all – because of the unpredictable nature of pain. This makes peer support groups very important – especially to men, who tend to restrict their socializing to a small group of friends; take away their workplace relationships and you can decimate their sense of belonging. Although pain support groups are widely recognized as being crucial to reducing isolation, they are understudied compared to the body of research about the efficacy of cancer or cardiovascular disease support groups. Hovey’s goal is to “expand the idea of support to include the moment a person begins that spiral of chronic pain,” and to flow that early support into a lifelong (if needed) continuum of meaningful personal connections. Early interventions would connect a new chronic pain sufferer with a buddy (another man suffering from chronic pain who can offer friendship and understanding), hopefully cutting off social isolation before it ever starts. The support circle would then expand to include a group of peers. Richard Hovey will host information sessions about Homebase on Wednesday, Nov. 30 at the NDG YMCA (4335 Avenue de Hampton) from 9 a.m.-12:30 p.m., and 5-7p.m. For more information, contact Ross Chechile: 514-486-7315, ext. 3102. I was listening to CBC’s The Current and got very interested about your support group. However, I went to the programme online and checked all links but could not find any information on how to reach you or attend your meetings…etc. Please advise.